When I was in high school, once a year everyone had to run The Mile. It was a dreaded, horrible event that struck fear into the heart of every teenager at West Perry High, and we’d all decamp for that gym session down to the gravel track that surrounded the football field. The rules were simple – four laps around, and if you didn’t complete it in under 14 minutes, then you’d have to run it again (I’m pretty sure this was set in place so some of my classmates couldn’t actually smoke a cigarette while completing it). I have a vivid memory one year of attaching myself directly behind an older girl I knew who was an all-season athlete and forcing myself to stay directly behind her for the whole four laps, even though it meant a coughing fit and near hyperventilation on the finish line. I completed The Mile in 8:15 that year, and it was by far the fastest I’d run it during my time in high school. Fast forward to 2013, when I’d signed up to compete in the British Transplant Games and I was suddenly faced with a track race having not set foot on a track since The dreaded Mile. Even though my running crew ran weekly track sessions, I’d avoided it up until now, thinking that I didn’t have any room in my weekly running schedule for more speedwork, especially since I already ran tempos once a week and had a busy evening social schedule. 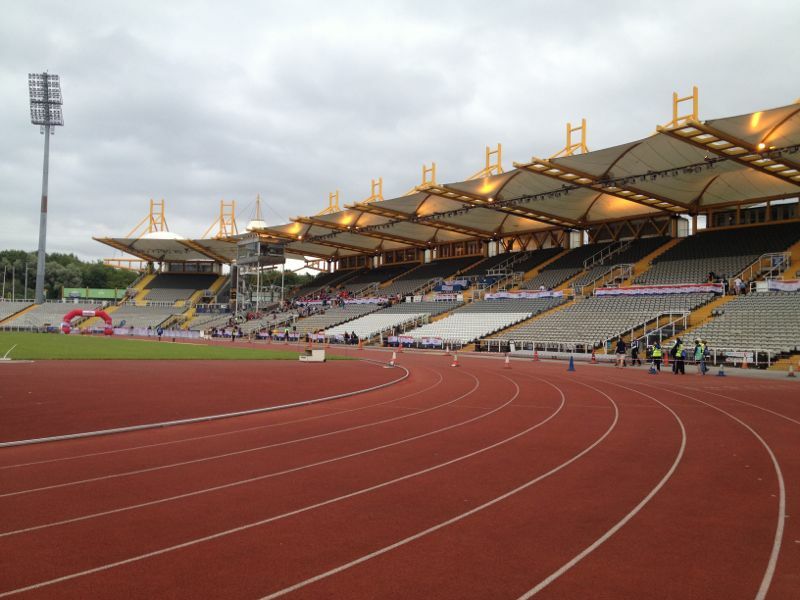 Reluctantly, I realised that I’d have to make time to practice on the track if I had a hope of racing on the track, so I started attending the weekly sessions at Mile End Stadium. When I first started running, I realised that I liked running on a treadmill because it allowed me to totally switch off my brain and Just Run, and I was assuming that running on the track would provide the same outlet. How wrong I was! On the treadmill, I’d been going at an easy pace, but at the sustained “suicide pace” of the track, my brain felt it necessary to constantly remind me how much the wind was ruining my times, that I was sure I’d be a few seconds faster than the last lap, what lap was I on again?, oh look at those kids over there…. you get the point. In distance running, my brain is my biggest asset – my thoughts keep me focused and I can set myself apart from the monotony of the distance. But on the track, my brain was hindering my performance and keeping me from pushing the pace like I needed to in order to endure the pain of 7.5 laps around (3000m). My trainer gave me a bit of advice that really helped however, and that was to simply count. She suggested I pick a foot and count that foot’s steps up to 20 and repeat, but in practice I find it easier to count my breaths, 1 to 20, and repeat, over and over until the sprint is done. It sounds incredibly monotonous, but it really helps me to give my brain a task so it doesn’t wander and let the dark, negative thoughts in that sabotage my times. The difference between road running and track running is just incredible!